Wow! These pictures are stunning!I can't even say which one I like best - they are all so fantastic! What a nice walk. Thanks for taking us along. what a wonderful walk! nice to see all the snow is gone!!! Gorgeous... definitely no need for words. Beautiful phots! what a lovely area! AMAZING! 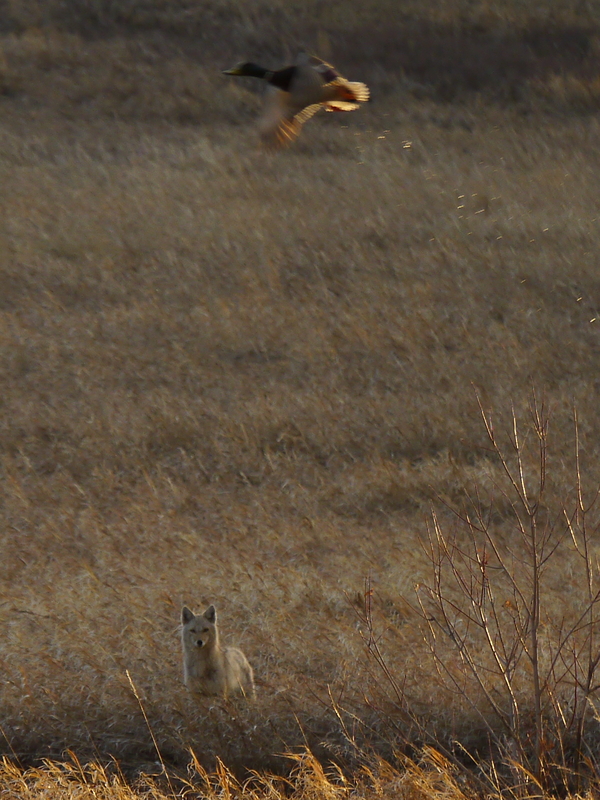 Especially the shot with the coyote and duck ~ what were the odds of getting that!! Thanks for sharing! Beautiful! You've inspired me to start those sunset walks at 60 Miles North of Nowhere! Great shots. I'm not sure I can even pick out a favorite! Very nice, you have such interesting things to look at...loved the previous post as well. Excellent photos! Number 3 is my fav. I saw that SAME moon, here in North Carolina last night~ Mine was darker and brighter. It looked like it had been sliced with a knife and had me wondering if I'd ever REALLY seen a half moon before! Beautiful! Montana is agreeing with you! What amazing surroundings for your walk. Beautiful! 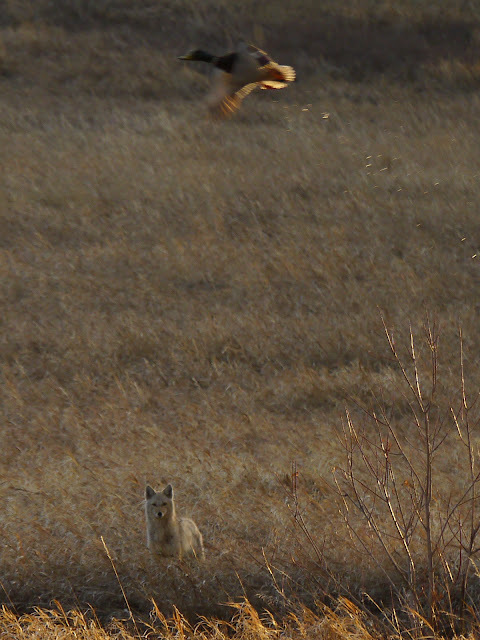 Even tho' I despise coyotes the photo with the duck is an amazing capture! Just happened by and have enjoyed your wonderful photography of beautiful MT. Hope your tooth is better soon. I love the light on dexterdog in the first one, and the one of the coyote with the duck.. awesome grab! !